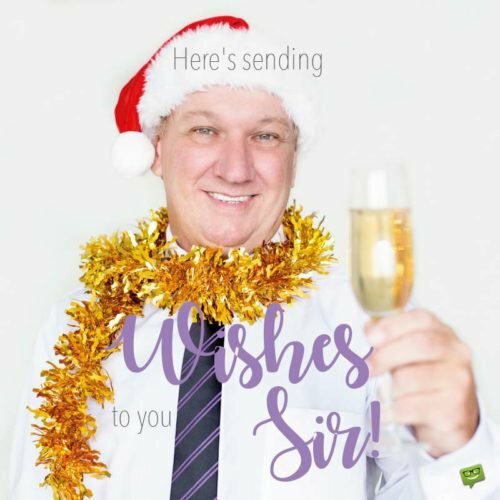 Christmas Wishes for Friends | Season's Greetings for a Pal! Christmas is a wonderful time of year to wish good things, especially to dear friends. But knowing which custom wish to give can be as hard as finding the right gift. 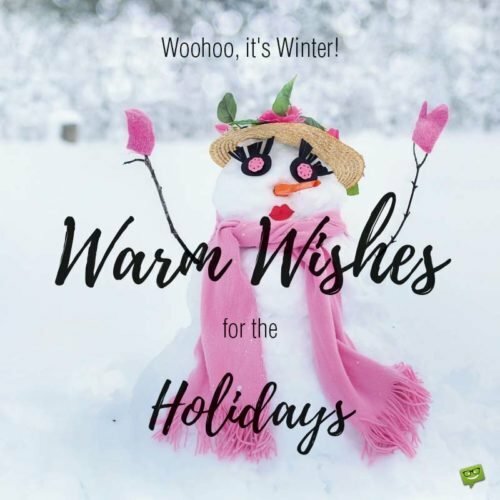 The following wishes will make this easier and the Holidays much merrier, so go ahead and share a special message with a friend. Here’s me hoping your holiday season is filled with stockings overflowing and cookies and pie to your hearts content. Merry Christmas, friend! May this day be merry and your heart jolly, dear friend. May Christmas find you in good health and high spirits. Dear friend, may the last days of this year fill your heart with cheer and the new days to come be even better than these. I hope Santa brings you everything you want this year. Not sure what else you could want since you have me, but hey, one can dream. Have a blessed Christmas from your BFF. May the day that celebrates the birth of Jesus Christ be sweet, magical, and hopeful for you and your family on this day and the rest of the year. May your morning be filled with laughter, gifts galore, holiday cheer, and everything that comes from Santa and the reindeer. On this Christmas, may your heart and your home be filled with all the love and joy this day brings. You deserve it. Happy holidays from me, your well-wishing friend. Christmas wishes and mistletoe kisses make this day memorable- but for me nothing compares to our friendship that I cherish the most. To my best friend, Happy Holidays. 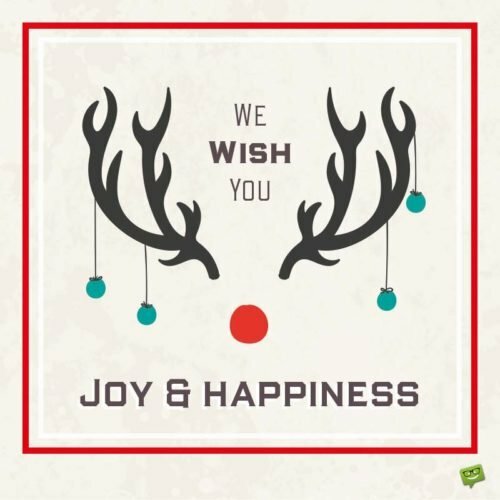 We wish you Joy & Happiness. To my friend: may all the blessings and gifts of heaven reach you on this special day of the year. Dear friend, I know this day can be tough, but remember its supposed to be happy and joyful. I pray you will grow some patience while Santa Clause does his thing- have the best Christmas ever. May you, your family and friends have a truly golden, blessed Holiday filled with Christmas presents and happy memories. Merry Christmas from your favorite friend. Wishing you many gifts under the Christmas tree, a plate full of pie, and a heart full of peace on earth. Have a heartwarming holiday, friend. I’m so glad that I can call you that. To my friend: At this time of the year, I am thankful for nothing more than our friendship. Presents under the tree, chestnuts roasting on the fire, carols singing- it’s the feeling I wish for you all year long. You deserve all the wonderful things this Christmas season has to give. The magic of Christmas is not in the gifts or even the giving- but its in the love and laughter shared with those we hold dear. I’m so glad our friendship is wrapped in these things. Dear friend, hope you have yourself a big, fat, amazing, awesome Christmas. Forget all that “little” stuff- it’s just not you. Hey friend, lay off the cake and cookies this year. Remember New Years is just around the corner and we have to get in shape again. Hoping this day will be a real memory to keep in mind forever, friend. Sorry I can’t be there. Some say that Christmas is a time for families to be united. Others say that friends are the family you choose- in that case, I’m so glad our family is together on this day, friend. When we’re together it might as well be Christmas every day- that’s how awesome our friendship is, right?! Merry Christmas, pal. I’m honored to have you as my friend- you’re the kind of person that has Christmas in your heart all year long. I couldn’t admire you anymore. Wishing you all the best wishes, cheer, and seasons’ greetings one can handle this year. Merry Christmas, X-Mas, and all the in-between, my friend. Dear friend, this season I wish you will open not just great presents but you will open your heart to all the great things coming your way. Even though you are on the naughty list, I’m still wishing you a Merry Christmas because you’re my friend. Have a good one. Woohoo, it’s Winter! 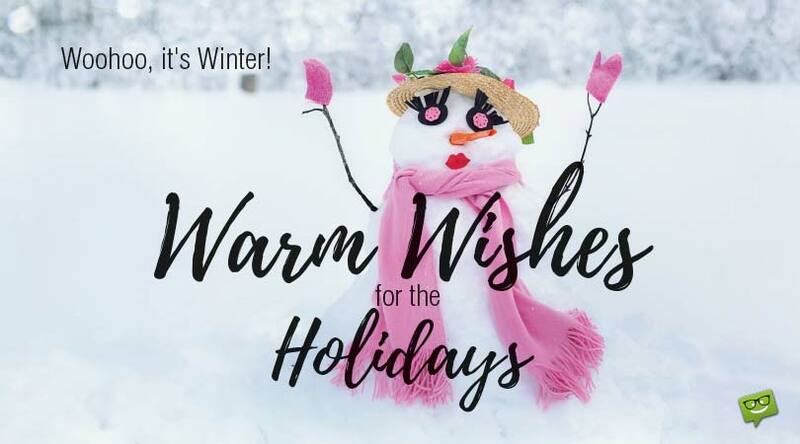 Warm Wishes for the Holidays. As they say, Christmas brings joy, love and peace, it softens the world and makes everything merrier- but you make it this way each and every day. So here’s wishing you the Merriest Christmas yet. You deserve it. It’s the most wonderful time of the year- but only because you are my best irreplaceable friend. Season’s greetings! The vibrations of your heart put the Christmas in the day. Thanks for being you. Every night and every day I pray for your success and happiness- because you are my friend. May this day be the best of them all and may the spirit of Christmas bring you all that. This season is less about what is under the tree and more about what people mean to each other- and you mean so much to me. Merry Christmas, friend. May what we have last a lifetime. Ho ho ho… Merry Christmas, you crazy human. I couldn’t hang out with you if you weren’t crazy- I’m crazy too! They say Christmas is not a time but a feeling- I’m so glad that our friendship has laughter, joy, and best wishes all year long. Merry Christmas and Happy New Year, BFF. Dear friend, from Christmas Eve to the New Year, I hope you give yourself the best gifts of all- respect, love, hope, forgiveness, and joy. And I hope our friendship already has those things. Hey friend, wishing you only success and happiness today and in the New Year. My warmest Season’s greetings. May all the stars in the sky shine on you and your family today, and may all the angels of the season visit your home with prosperity, success, and hope. Dear friend, may you roll with laughter, sing with spirit, and stuff your face full on this day and all the ones to follow.